Thursday July 9th. Forgot to add this one before we went on holiday. Lovely evening circuit with Marie starting at the new car park, up past Pitreadie Farm. Followed the tracks up Hare hill before coming upon the summit from the south. Descent by the usual route. 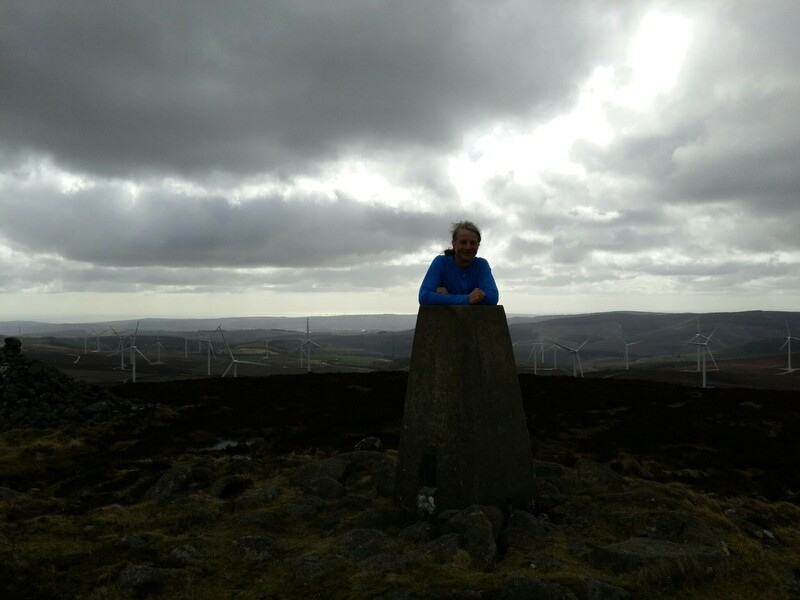 Lovely views to the north and west, unfortunately wind farm to the south detracts from views to the sea. This entry was posted in cp94 and tagged KatieH, MarieE on July 21, 2015 by site_admin. Kirsty and I ran from West Knockhill Cottage and the new car park, which I hadn’t seen before. Same old badly eroded track high up and blowing a real Aberdeenshire hooley today. Didn’t stop on the top for that reason but headed straight over the other side and all the way down to the single track which eventually joins the main forest track and heads all the way to the Bridge of Bogendreip. Nice point to point route that reduces the time on the grotty track on the normal uphill route. 15k and 380m of climb or so. This entry was posted in cp94 and tagged RogerC on June 6, 2015 by site_admin. I started from the car park at the Stock Mounth sign. I haven’t been up the hill since it was all moorland. 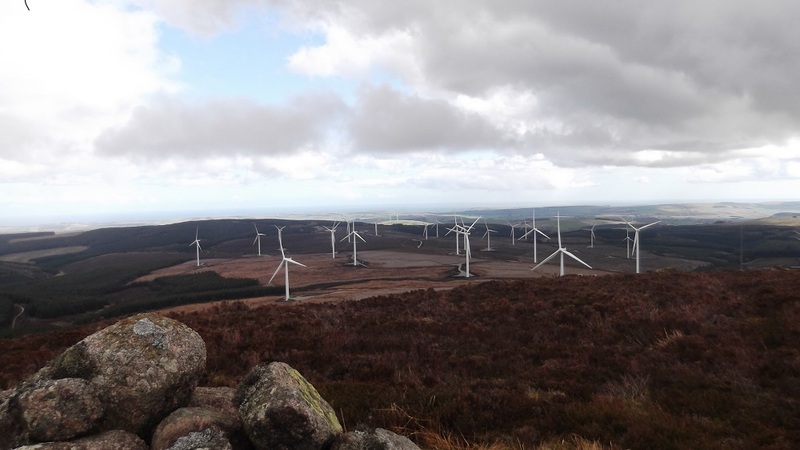 The track is badly eroded, especially up in the forest area and the wind farm changes the landscape a bit. 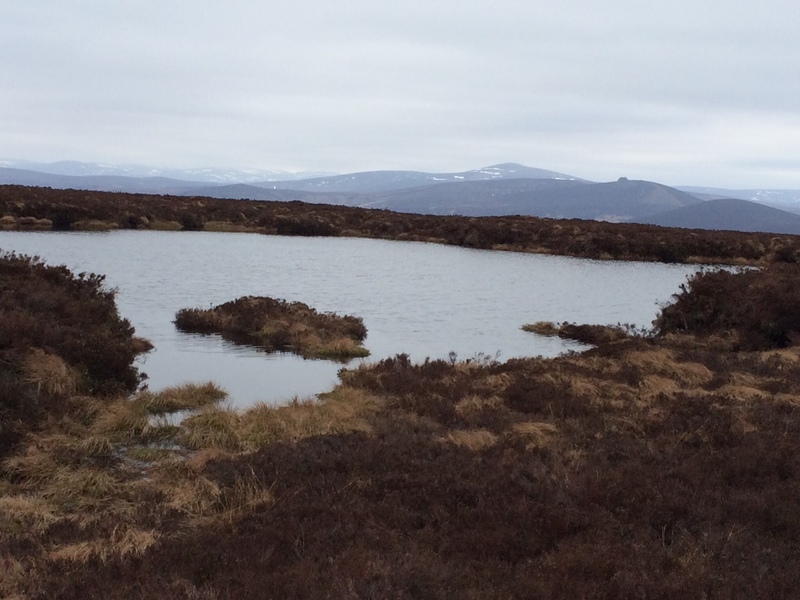 Birds included kestrel, buzzard, song thrush, curlew, snipe, goldcrest, skylark, lapwing, siskin and pied wagtail. This entry was posted in cp94 and tagged Phil on April 30, 2015 by site_admin. Parked in the new car park opposite West Knockhill Cottage, room for several cars. Excellent running route all the way to the top of Kerloch, although some serious gully erosion and big stones on the upper track, cyclists beware. Curlew and Skylarks singing in the valley. Frog spawn in puddles on the way up. A memorial to the owner of the little hut at 3 km, at the side of the track. Near the top the mass of windmills suddenly came into view. Great views all round from the top. A couple of walkers suddenly surprised me from behind the cairn .I got them to take my picture. A very enjoyable run. This entry was posted in cp94 and tagged JaneO on April 2, 2015 by site_admin. Up the Pitreadie Farm track, and onwards to Melmannoch. 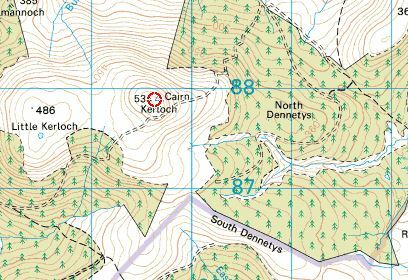 Then on up by the fence to Little Kerloch, which took a while to find, amongst the peat bog on the hilltop, with lots of dykes and wet patches to cross – not a good running route! 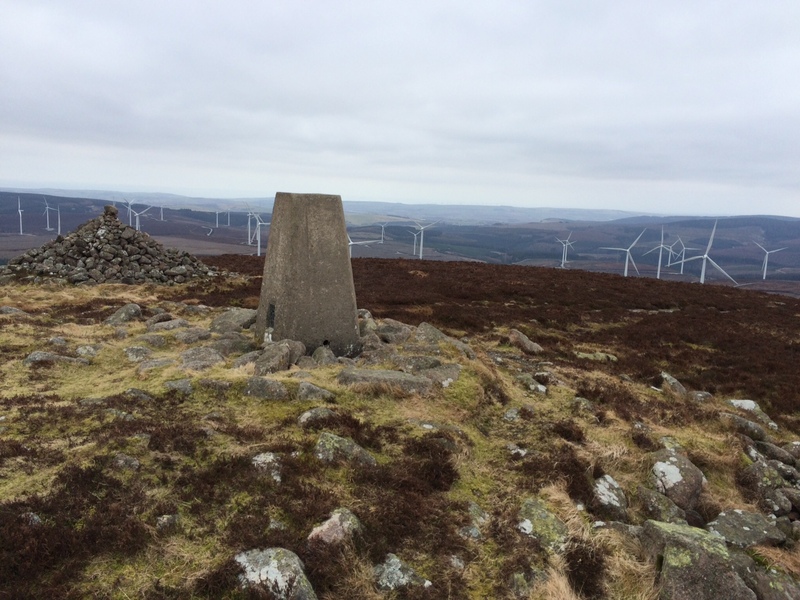 Back to the fence line up to the trig point on top of Kerloch, with clear countryside looking north and massive wind turbine farm to the south side. Little Kerloch with Clacknaben to the west. This entry was posted in cp94 and tagged Warren on March 15, 2015 by site_admin. Choose to take the footbridge to Heathery Haugh river crossing from the Clachnaben car park. On getting to the bridge I was excited to see that it was a small raft on a wire which one uses to pull oneself across the river but further investigation showed that my failure to get it moving was due to it being padlocked. Plan B – rather than try to cross the river I reversed and took a deviation to the Bridge of Dye. Once on the west side of the river I followed the track to Heathery Haugh. From there, good paths lead to Hare Hill and onwards to Little Kerloch. Alas, there were no paths and the terrain can only be described as peaty. 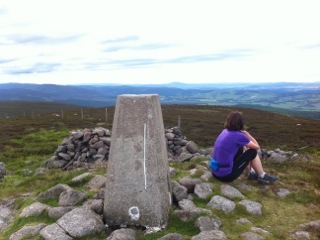 Eventually the summit of Kerloch was reached. In reverse, the forestry track was taken and was much quicker. This entry was posted in cp94 and tagged Duncan on March 2, 2015 by site_admin. Set off on our bikes to make use of the land-rover track which goes all the way from Knockhill over the top of Kerloch. Went OK for a while but snow was lying in the tracks once we entered the woods and we had to abandon after passing the hut at Glenskinnan and just where the track splits. From there it was a 1.5km hike to the top in our SPDs. Took a breather in the stone circle shelter at the top and time for a photo. I haven’t got a tripod for my camera phone so have been using ‘natural’ ones, bit of moss, top of a small conifer and today perched on snowy rock taking front camera selfie. Hike back, meeting some well-clad walkers who probably thought we were under-dressed and bonkers. 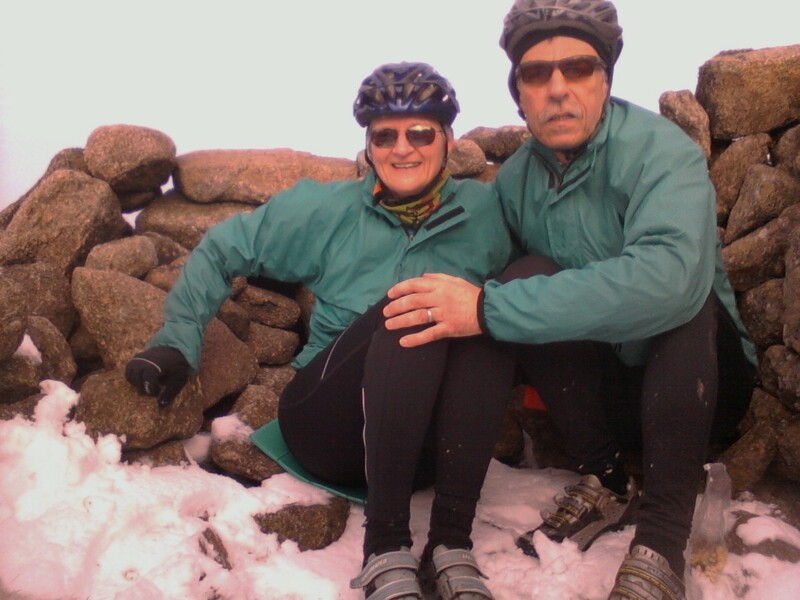 Good fun back on our bikes as we skidded our way back through the snow. This entry was posted in cp94 and tagged D&E on February 25, 2015 by site_admin.